The same way we wouldn’t use our forearm to build our house, these three youth ministry measuring rods cannot tell us whether our kids are growing in their relationship with Christ. For years I used the metric of the meeting and the “success” of that meeting to gauge the spiritual maturity of my youth group. If their were good vibes then their was growth right? If kids like the meeting they must like Jesus too, right? Wrong. The meeting is a tactic of discipleship. The meeting is a chance at making disciples but the meeting itself does not make disciples. Good attendance, listening well, bringing a Bible only shows us the surface but it is a start. Everyone wants the meeting to grow, the Pastor, the parents, and us. The kids, not so much. This is another false positive. If the youth group is growing we must be making disciples right? No, an exciting youth meeting can draw a crowd but it does not mean our kids are growing in their faith or becoming followers of Jesus. Does this sound like a meeting our kids would like? I don’t care if they like it. Jesus didn’t ask if they liked it. He did it because he was making them into world changers and preparing them for the challenges ahead. The meeting is not making disciples. The meeting is an excuse to make disciples. We assist families in making disciples by speaking into the life of the students and equipping and training parents. How many is the battle cry, right? It makes us feel good when they show up and we put when they don’t. I get it, we are paid or volunteer to make kids happy. We are asked to make a youth ministry that is pleasant to the eye and preach messages that are palatable to the heart.That’s fine. That’s our job description, but it’s nor our calling. Provide resources and accountability to assist them. We should be using meeting and events as an excuse to make disciples. Events may make us feel good, build community, and make the ministry look good but they don’t make disciples, we assist families in making disciples by challenging kids and families to move from one atmosphere to another. These reasons are not bad in and of themselves because these are teenagers. They are looking for something, anything that will solve a problem or ease their pain. It is the emphasis we place on it that makes it a terrible tool for measuring the spiritual growth of individual kids. The altar can be and is a wonderful place to experience God. The altar is a tool to move kids into a new atmosphere of spiritual growth. Kids praying a prayer, signing a card, or jumping up and down are not good metrics for a life time journey with Jesus. They are are great moments with Jesus but as we grow older we pray less prayers, sign less cards, and jump less. If these things fade does this mean my relationship with God is fading too. I would say no. Let me show you how this process worked recently in the life of a student who, over the past year, has moved from atmosphere to atmosphere. Sam was a fairly quiet kid when he first started coming to our group. He came along with some other friends. When these friends quit attending he stuck around. I made it my goal to help him move the dial in his own life. Sam came to the meeting where I made it a point to talk with him every week. Sam came to some events where I talked with him about serving in the ministry. Eventually he volunteered to help in various roles to make the meeting happen. The following week, there was Sam, raising his hands during worship and later coming to the altar for prayer. At the altar I used the opportunity to affirm his actions and challenged him to keep it up and prayed for him. Afterwards, we talked and he said both activities were positive experiences and was more likely to do them again. When same came to some events he expressed being a part of community but that is not necessarily the same as being Spiritually Interested but it could be interpreted that way. But, at the bowling event, not a retreat, he expressed spiritual interest in his own faith and his desire for it to grow. When I challenged him to step into a new atmosphere of trust with God by considering lifting his hands and responding to the altar, he became Spiritually Excited, especially after he tried it. Today, being Spiritually Passionate, is something we must all maintain. It is a fire we must keep stoked. I will continue to encourage Sam at every meeting, every event, and every altar time to trust God more fully. The meetings, the events, and the altar are not making the disciples, I am. And so must you. Have you been measuring kids walk with God using ineffective metrics? Which ones? 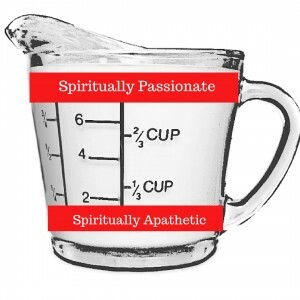 How hard would it be to change the way you measure discipleship in your youth ministry? How hands on are you in making disciples vs letting the programs do it for you?